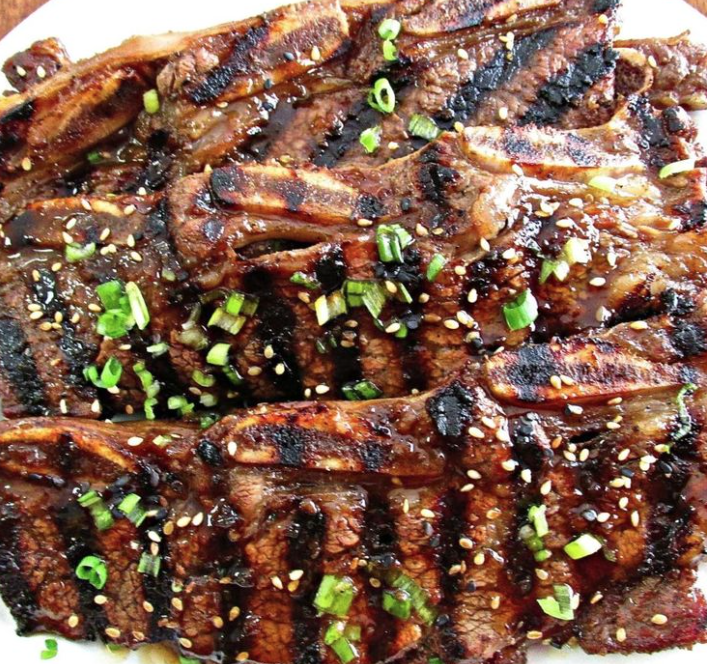 Korean BBQ Short Ribs (Kalbi), Intense Flavor, Juicy & Incredibly Satisfying! Get ready for a seriously great tasting dish that’s still surging in popularity! These incredibly succulent ribs with a rich, meaty flavor that is uniquely its own are making waves across America and will be one of the best-tasting ribs you could ever cook! For an easy and delicious rib dinner at home in a small amount of time, you’ll definitely want to try this one! Unbelievably tasty, tender and juicy ribs in 10 minutes. The ingredients provide a garlic, smoky, sweet and savory flavor that’s incomparable to anything you’ve ever tasted – both mouthwatering and habit forming! The secret is to marinate overnight. No exceptions. This seals in the flavor and tenderizes the flanken beef short ribs before grilling them to mahogany brown perfection. They’re a real crowd-pleaser at dinner, barbecues or special occasions that you’ll want to make again and again. Enjoy! Delicious, tender and juicy ribs grilled to perfection! There’s nothing like it! 1 1/2 Cups soy sauce or Gluten-free Tamari Soy Sauce by San-J. Place ribs in a large Ziplock bag, or a dish that can hold them all, or a large pot with lid. In a separate bowl, combine all the marinade ingredients together and stir/mix for 1 minute. Pour the marinade into the pot, dish, or Ziplock over the meat making sure the ribs have been coated. Seal or cover and refrigerate overnight. In the morning, turn over the ribs in the marinade to ensure full saturation. Continue to refrigerate until its time to grill. Heat the grill to a medium-high heat until it’s nice and hot. Add the meat and grill each side for 3-4 minutes. Garnish with additional slices of green onion and toasted sesame seeds, and serve. Cook on the grill (charcoal is best), oven broiler, or large skillet on high heat for 3-4 minutes on each side. For toasted sesame seeds, lightly brown in a dry skillet over medium heat for 3-5 minutes, stirring occasionally. Or bake on an ungreased baking sheet at 350° for 8-10 minutes or until lightly browned. Korean BBQ Ribs is great with white rice. Also try them with these Crispy Garlic Green Beans, ’cause they’re good! Want Another Great Recipe? Now Watch How To Make The Best Mongolian Beef! Peanut Butter & Jelly Bars, A Rich & Creamy Dessert That Brings Back Memories! Very Berry Oatmeal Bake, Delicious With Brown Sugar, Vanilla & Cinnamon! Thai Cucumber Salad, Super Fresh & Fast With DELICIOUS Asian Flavor! Butter Cake Chess Squares, Rich, Flaky & Buttery It’ll Go REALLY FAST! Easy Homemade Chicken Soup, A Delicious Hearty Soup That’s Ready In An Hour! The Best Grilled Chicken Marinade, Juicy, Tender & Delicious Results! © 2019 Get In My Belly.